Our high-quality range of signal generators includes numerous types of test equipment and accessories. To supply accurate and reliable signal generation hardware and accessories, we work with advanced tech brands like Rohde & Schwarz, Tektronix, BK Precision, Keysight Technologies, and Metrix, complementing the enhanced value signal generator and analysis products in our own RS PRO line. What are signal generators used for, and what types are available? Frequency Counters: Used for measuring frequency in a number of oscillations/pulses per second for a periodic electronic signal. Used to inject waveforms into a DUT (device under test) for tracking/analysis testing. 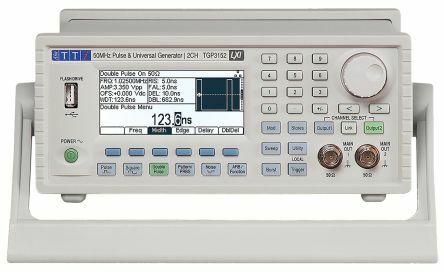 Pulse Generators: Used to inject pulse signals (digital, analogue or both) into DUTs. Spectrum Analysers & Accessories: Used for analysing the spectrum of radio frequency (RF) kit and audio signals to test and diagnose circuit performance. Whatever the specific generator or analyser type you require for your workplace testing and development tasks, all signal generators are essentially designed to produce various electrical signals in the form of waves. These waveforms are then used as direct stimuli for other items of equipment, including many different types of radio hardware, logic boards, and other electronic/electroacoustic devices that can be fed with particular waveforms during testing or troubleshooting processes. 0.5 Hz to 5 MHzSine, Square, Triangle, Pulse, & Ramp outputCoarse and Fine tuning4 digit LED displayLinear and log sweepVariable duty cycleVariable DC offsetVariable amplitude output plus 20dB attenuator20Vpp output into open circuit (10Vpp into 50 Os).